Who knew mystery better than Sir Arthur Conan Doyle? Who knew science fiction better than H.G. Wells? Who knew high adventure better than�Escape? Venture into dark forests and darker jungles for suspenseful stories of creatures and curses, trains and treasure, secrets and superstitions. Jack Webb, William Conrad, Paul Frees, Peggy Webber, John Dehner and Gerald Mohr thrill in tales by Doyle, Wells, Robert Louis Stevenson, Roald Dahl, Stephen Vincent Benet, and more. Delve into dramas of love, honor, immortality...and the law of unintended consequences. 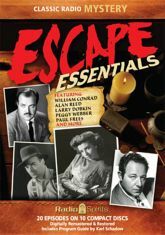 Includes twenty digitally restored and remastered episodes, and a Program Guide by Karl Schadow.